Frankfurt - Standing at almost seven feet tall and currently leading the Bundesliga scoring charts, is a hard man to miss these days, even if the unassuming Eintracht Frankfurt attacker would prefer to stay out of the limelight. 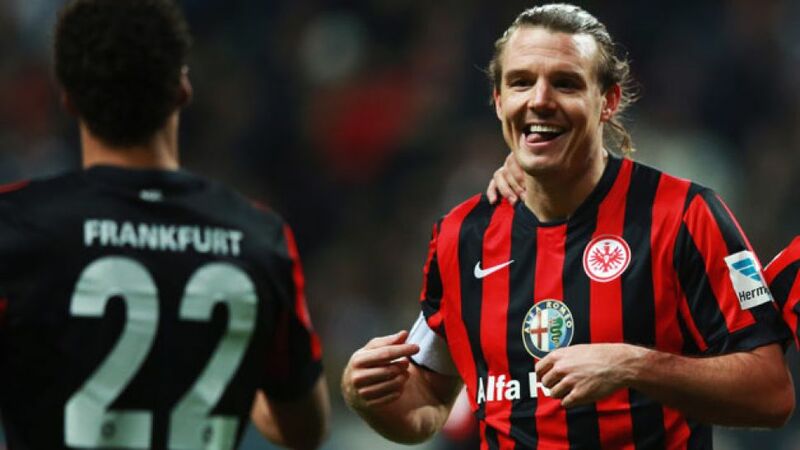 The 31-year-old has spent a decade on the club's books, and while he has always been a gifted player, it is only recently that the "football god", as Frankfurt supporters have dubbed him, has earned widespread praise. "Meier is phenomenal," purred Bayer 04 Leverkusen sporting director Rudi Völler in an interview. "He's the kind of player who you can lose sight of for a quarter of an hour, but he has one of those rare gifts to find the right place at the right time to strike clinically. He knows exactly where he has to be and he's a constant threat, in addition to being strong in the air." Völler saw his words vindicated on Matchday 17 when Meier grabbed his 13th league goal of the season to secure a 1-1 draw away to Leverkusen. The strike, a 36th minute penalty, put Meier three goals clear of FC Bayern München's Arjen Robben at the summit of the top scorer's list, and six ahead of seasoned Bundesliga forwards Robert Lewandowski and Klaas-Jan Huntelaar. Such has been Meier's form that he is widely tipped to go on to clinch the Torjägerkanone this season, although the modest frontman has other objectives in mind. "If I win it or not doesn't really matter," he said. "All that matters is that we win games as a team." Meier instead predicts that a Bayern player will reel him in over the second half of the season. The contrast between Meier's humble off-field demeanour and the ruthless, prowling presence on it is striking, and has contributed to his popularity among the Frankfurt faithful. His decision to stay at the club following relegation in the 2010/11 season also cemented his place as a fan favourite, as has his eye for goal: despite playing ostensibly as an attacking midfielder, Meier has netted 95 times in 285 appearances for the Eagles. "Alex knows exactly where the ball's going to drop to score a goal," said Frankfurt coach Thomas Schaaf, who after initially leaving Meier on the bench at the start of the season, now knows exactly how to get the most out of his prolific No14. The arrival of Haris Seferovic has also helped, allowing Meier to play in a more withdrawn position, albeit with more freedom to roam and move between the lines. Meier's best single-season goal tally in the top flight is 16, achieved in 2012/13. At his present rate, he will overtake that by the end of February and maybe even inspire Frankfurt to a return to the European stage.